References fp_Run::_setDirection(), fp_Run::_setDirty(), fp_Run::_setLength(), fp_Run::_setRecalcWidth(), _setTargetFromAPAttribute(), _setTitleFromAPAttribute(), fp_Run::_setWidth(), UT_ASSERT, and UT_BIDI_WS. References DELETEPV, m_pTarget, and m_pTitle. Reimplemented in fp_AnnotationRun, and fp_RDFAnchorRun. References DELETEPV, gchar, and m_pTarget. Referenced by _setTargetFromAPAttribute(), and fp_RDFAnchorRun::fp_RDFAnchorRun(). References fp_Run::_setHyperlink(), _setTarget(), gchar, PP_AttrProp::getNthAttribute(), fp_Run::getSpanAP(), m_bIsStart, and m_pTarget. Referenced by fp_AnnotationRun::fp_AnnotationRun(), fp_HyperlinkRun(), and fp_RDFAnchorRun::fp_RDFAnchorRun(). References DELETEPV, gchar, and m_pTitle. References _setTitle(), gchar, PP_AttrProp::getAttribute(), fp_Run::getSpanAP(), and m_pTitle. References fp_Run::findPointCoords(), fp_Run::getNextRun(), and UT_ASSERT. Referenced by FV_View::_deleteHyperlink(), FV_View::_deleteXMLID(), FV_View::cmdHyperlinkJump(), FV_View::cmdHyperlinkStatusBar(), fp_Line::containsAnnotations(), Defun(), fp_Run::draw(), fl_BlockLayout::format(), fp_Line::getAnnotationContainers(), fl_AnnotationLayout::getAnnotationRun(), FV_View::getColorAnnotation(), FV_View::getColorRDFAnchor(), fp_Run::getFGColor(), IE_Imp_RTF::insertStrux(), and fl_BlockLayout::recalculateFields(). Referenced by FV_View::cmdHyperlinkCopyLocation(), FV_View::cmdHyperlinkJump(), FV_View::cmdHyperlinkStatusBar(), and s_doHyperlinkDlg(). 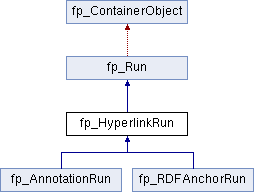 Referenced by fl_BlockLayout::_finishInsertHyperlinkedNewRun(), s_doHyperlinkDlg(), and fp_Run::unlinkFromRunList(). References fp_Run::getNextRun(), fp_Run::mapXYToPosition(), and UT_ASSERT. Referenced by fp_RDFAnchorRun::_draw(), fp_AnnotationRun::_draw(), fp_RDFAnchorRun::_recalcWidth(), fp_AnnotationRun::_recalcWidth(), _setTargetFromAPAttribute(), and fp_RDFAnchorRun::fp_RDFAnchorRun(). Referenced by _setTarget(), _setTargetFromAPAttribute(), fp_AnnotationRun::fp_AnnotationRun(), fp_RDFAnchorRun::fp_RDFAnchorRun(), fp_AnnotationRun::~fp_AnnotationRun(), ~fp_HyperlinkRun(), and fp_RDFAnchorRun::~fp_RDFAnchorRun(). Referenced by _setTitle(), _setTitleFromAPAttribute(), and ~fp_HyperlinkRun().